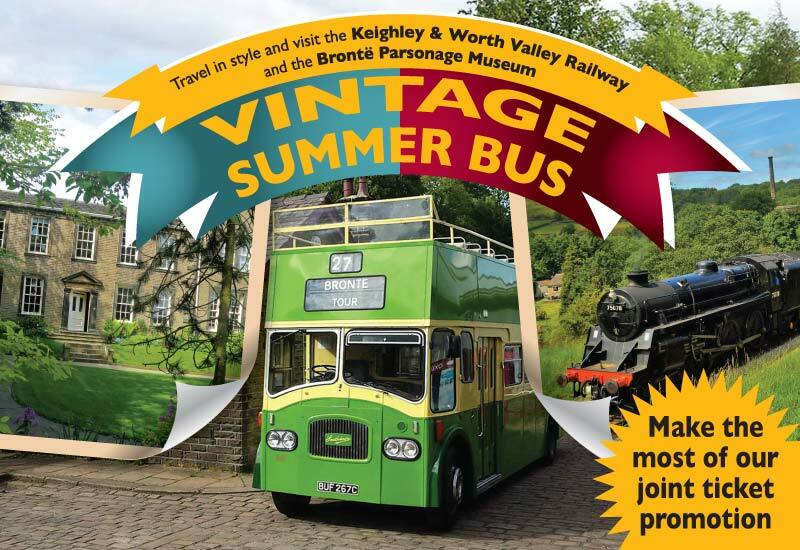 The Vintage Tour bus, that has been a feature for the past few years, returns on Monday 11th July but this year will operate everyday, including weekends, right the way through the summer to the 4th September giving a tour of the Valley from Oxenhope to Haworth. Whilst the sun has not made the appearances we would all like, hopefully, now that the tour bus is running, summer will finally get into full swing and, when it does, you will be able to enjoy the ride in one of two open top buses supplied by Classic Vehicles of Yesteryear. In inclement weather you can enjoy the scenery, away from the elements, in one of their restored ex-Leeds and Bradford 1950 / 1960s double decker buses. Make the most of the bus and spend a full day in Haworth. Buy a Rover ticket on the railway and then travel on the bus for free and receive a voucher for a £2 discount off your entry to the Bronte Parsonage Museum. Alternatively if you start at the Bronte Parsonage Museum you can purchase a full price ticket and then receive a £2 discount voucher off your Rover ticket, plus free travel on the bus.